Visual Business Intelligence – Why Do We Visualize Quantitative Data? Why Do We Visualize Quantitative Data? Data visualization is the use of visual representations to explore, make sense of, and communicate data. But why is it that we must sometimes use graphical displays to perform these tasks rather than other forms of representation? Why not always express values as numbers in tables? Why express them visually rather than audibly? Essentially, there is only one good reason to express quantitative data visually: some features of quantitative data can be best perceived and understood, and some quantitative tasks can be best performed, when values are displayed graphically. This is so because of the ways our brains work. Vision is by far our dominant sense. We have evolved to perform many data sensing and processing tasks visually. This has been so since the days of our earliest ancestors who survived and learned to thrive on the African savannah. What visual perception evolved to do especially well, it can do faster and better than the conscious thinking parts of our brains. Data exploration, sensemaking, and communication should always involve an intimate collaboration between seeing and thinking (i.e., visual thinking). Despite this essential reason for visualizing data, people often do it for reasons that are misguided. Let me dispel a few common myths about data visualization. Myth #1: We visualize data because some people are visual learners. While it is true that some people have greater visual thinking abilities than others and that some people have a greater interest in images than others, all people with normal perceptual abilities are predominantly visual. Everyone benefits from data visualization, whether they consider themselves visual learners or not, including those who prefer numbers. Myth #2: We visualize data for people who have difficulty understanding numbers. While it is true that some people are more comfortable with quantitative concepts and mathematics than others, even the brightest mathematicians benefit from seeing quantitative information displayed visually. Data visualization is not a dumbed-down expression of quantitative concepts. Myth #3: We visualize data to grab people’s attention with eye-catching but inevitably less informative displays. Visualizations don’t need to be dumbed down to be engaging. It isn’t necessary to sacrifice content in lieu of appearance. Data can always be displayed in ways that are optimally informative, pleasing to the eye, and engaging. To engage with a data display without being well informed of something useful is a waste. Myth #4: The best data visualizers are those who have been trained in graphic arts. While training in graphic arts can be useful, it is much more important to understand the data and be trained in visual thinking and communication. Graphic arts training that focuses on marketing (i.e., persuading people to buy or do something through manipulation) and artistry rather than communication can actually get in the way of effective data visualization. Myth #5: Graphics provide the best means of telling stories contained in data. While it is true that graphics are often useful and sometimes even essential for data-based storytelling, it isn’t storytelling itself that demands graphics. Much of storytelling is best expressed in words and numbers rather than images. Graphics are useful for storytelling because some features of data are best understood by our brains when they’re presented visually. Graphs reveal the big picture: an overview of a data set. An overview summarizes the data’s essential characteristics, from which we can discern what’s routine vs. exceptional. The series of three bar graphs below provides an overview of the opinions that 15 countries had about America in 2004, not long after the events of 9/11 and the military campaigns that followed. Based on this table of numbers, I had to read each value one at a time and, because working memory is limited to three or four simultaneous chunks of information at a time, I couldn’t use this display to construct and hold an overview of these countries’ opinions in my head. To solve this problem, I redisplayed this information as the three bar graphs shown above, which provided the overview that I wanted. 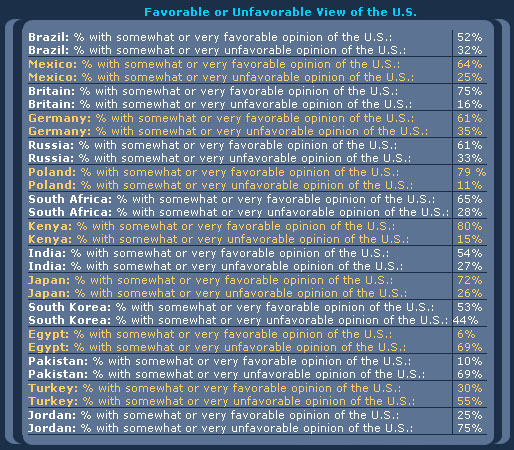 I was able to use it to quickly get a sense of these countries’ opinions overall and in comparison to one another. Try to quickly compare the magnitudes of values using a table of numbers, such as the one shown above. You can’t, because numbers must be read one at a time and only two numbers can be compared at a time. Graphs, however, such as the bar graphs above, make it possible to see all of the values at once and to easily and rapidly compare them. Many quantitative messages are revealed in patterns formed by sets of values. These patterns describe the nature of change through time, how values are distributed, and correlations, to name a few. Try to construct the pattern of monthly change in either domestic or international sales for the entire year using the table below. Difficult, isn’t it? The line graph below, however, presents the patterns of change in a way that can be perceived immediately, without conscious effort. You can thank processes that take place in your visual cortex for this. The visual cortex perceives patterns and then the conscious thinking parts of our brains make sense of them. Visual representations of patterns are easy to compare. 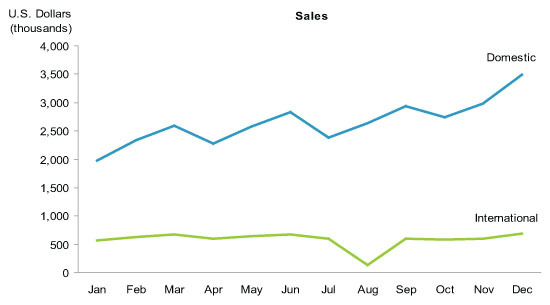 Not only can the independent patterns of domestic and international sales be easily perceived by viewing the graph above, but they can also be compared to one another to determine how they are similar and different. These four quantitative features and activities require visual displays. This is why we visualize quantitative data. This is a very thorough and useful argument for visual analysis, Steve. As I was reading it, one thought popped into my head, about how much easier it is to appreciate or feel the impact of the size of a difference when it’s displayed visually, versus trying to appreciate the impact by processing the differences in our heads. I reckon this goes for comparing individual numbers to one another, but also for comparing patterns (signals) among groups of numbers. Visual analysis also makes it easier to interpret what the numbers mean, because it’s easier to see the context of those numbers, such as historic patterns. Smiles. Yes, we feel the impact of magnitude differences more greatly when we view them visually because our brains understand them better, which allows the truth of the matter to sink in. To your other point regarding context, much of the benefit of the overview that a graphical display provides is the ability to see all of the pieces in the context of the whole. A really great article that is a very persuasive and concise argument as how we need to use visualisation to give meaning to data. It’s an area I’m looking at right now, and I do wonder if we need to go further still to look at the next step, the decision-making and actioning phase. I think that (i.e. what’s required for people to convert analysis into actions) is an area that’s been under-developed in the established Analytics technologies. I’ve had a few conversations over the last few years with people who, like you, recognize a chasm between enlightening data analyses on the one hand and potential outcomes in the form of decisions and actions based on them. So far we haven’t done a good job of building a channel to support the logical flow from insight to resulting action. The channel that’s needed is one of communication. When insights occur, how do those who experience them communicate that information in an understandable way to the people who are in a position to take action? Technology will not solve this problem. Like so much of life, the solution involves clear thinking to experience insights in the first place and clear communication to pass them on to others. These are the fundamental human skills that we often trip us up because we don’t take time to develop them. In his book “Thinking, Fast and Slow,” Daniel Kahneman described organizations as fundamentally needing to be “decision factories,” but usually failing to develop the skills necessary to function effectively as such. Unfortunately, most organizations don’t recognize the essential importance of these basic human skills. One piece I’ve been thinking a lot about lately is animation, filtering, and cognitive engagement. Although you’d think that exploration and communication are opposite ends of the spectrum, inviting exploration is a powerful way to engage people in a story. More and more, news organizations are providing visualizations where the data can be filtered or explored. One recent example, which almost seems late to the trend, is a NY Times map of the US, colored according to the predominant baseball fans’ teams. The overall map was explorable, and they had short articles on several sections where the data suggested an interesting story. In my own work, I recently converted bar graphs where filtering takes you to a separate web page into animated graphs. Being able to see the bars grow and shrink as you add and remove filters makes changes far more obvious, and encourages more exploration. As you explore the possibilities of animation, be careful to apply it wisely. Animating transitions between different views of data or states in data, if done quickly and simply, can help people maintain orientation. Animating data to show change through time, as Hans Rosling does, can be useful for data-based storytelling. We know, however, based on research, that animating data to show change through time is not useful for data exploration and analysis. Attention is limited, so we can’t simultaneously follow the movement of more than a single object or two. For this reason, using a series of small multiples to show change through time usually works better for data exploration and analysis. Animation works for storytelling because the teller can narrate the action, telling people where to look when something significant occurs. Thanks for this excellent post. I’m especially interested in the connection between communication and informed decision making. Are there optimal ways we can communicate data-driven information to facilitate decision making? Usually, people who produce numerical or visual data information are not directly involved in the decision-making process (except to provide information that supports it). Are there specific things that decision-makers are looking for in terms of quality and quantity of information? I would be curious to hear your thoughts on this. Unfortunately, I don’t have a ready answer to your question. One factor that comes to mind, however, is the importance of a culture of evidence-based decision making, which is not yet prevalent among most organizations, despite what they think or claim. Even those organizations that have reputations for being analytically savvy do not usually embrace evidence-based decision making as a whole. I know that because I’ve worked with several that fit into this category. Decisions are largely made on the basis on intuition. While it is true that we can often trust our intuition to guide us–the more expert we are, the more we can rely on it–even the best intuition is only useful when we’re faced with situations that fit patterns that we recognize based on past experience. Analytical thinking requires time and effort that most decision makers aren’t willing or able to give it. Many of the challenges that we face today are complex. Organizations that recognize this and commit themselves to either hiring people with good critical thinking skills or to training people in these skills will create the culture and capabilities that are needed for handling complexity. A good question – when it comes to the really big decisions, good examples of data driven decision making can be found in oil & insurance companies. These industries have to be comfortable with decisions made in very uncertain environments, and therefore use tools that allow them to make decisions based on probabilities. The BI world doesn’t really talk about this much, although the vendors offer some high end tools for exactly these purposes (see IBM’s ILOG and Oracle’s Crystal Ball for examples). Do a search for the term “Decision Analysis” for more information, it’s a rich and interesting field, and relates directly to the “Stochastic Optimisation” tip of the “Maturity Curve” we’ve all seen. What visualization tool would you suggest? It’s difficult to answer your question because different tools have different strengths and no one tool that exists today can serve all purposes well. To get a sense of these different uses of data visualization, you might want to read my article title “Use-based Types of Quantitative Display.” If you have a specific use in mind, I and others might be able to suggest tools that you ought to consider. A picture of quantitative information is indeed worth a thousand words, but only when it’s used to display the features and support the tasks that I’ve described. A picture that’s used for the wrong purpose–one that it cannot support–should be replaced with words and numbers. Words, numbers, and pictures play different roles in communication. Knowing when to use one form of expression rather than another is critical. Excllent discussion thread about the need for actions and improved business performance and outcomes based on the new insights and data-evedence based decisions. Often I see that great insights are shared in disjointed email discussion threads with cut and paste into powerpoint decks and PDFs. Though leadership and culture of the organization impacts the decison making process, technology can assist and facilitate collaborative decision making. I think Enterprise Social technology can play this role, making it easy to share and collaborate on a key insight from data visualization and discovery, if it is as easy to share like Facebook. One added benefit is Organizational learning by self-documenting insights, context, discussions, decsions taken and results. Today knowledge is lost in outlook PST files and archives when employees leave. I see that some BI/Analytics vendors begin to provide a collaborative layer, but others point out that they don’t want to add another silo. Ideally tool vendor must provide links to major enterprise social platforms. Great post. I have banging this proverbial drum with my clients for years. A slight aside… Are you aware of any studies in this topic (i.e. human perception of data in different formats)? I am a BI consultant and I am constantly striving to get my clients to embrace charts to show values instead of tables of ‘just show me the numbers’, but it would be very helpful if there was a formal study that illustrates the point? I suggest that you begin by reading “Visual Thinking for Design” by Colin Ware. On the first bar graphs that you created in lieu of the PBS data flood, why not have just one chart rather than three with the colors stacked (positive | neutral | negative)? Are you suggesting stacked bars? If so, it would only be easy to decode the values of the first segment (positive opinions) and it would be difficult to compare the neutral opinions because the middle segments of the bars would not be aligned with one another. By separating positive, neutral, and negative opinions into their own graphs, I was able to solve these problems. You refer to our working memory chunck capacity of three to four chuncks. As chuncking and human information processing is familiar to me (and you to of course)im used to another number of chunks, but i would be verry interesting to read your source regarding this, as it could affect the way i design solutions to enhance decision-making. My primary resource for information of this type is Colin Ware of the University of New Hampshire. Both of Colin’s books — Information Visualization: Perception for Design and Visual Thinking for Design are excellent.